PETREUS, D. , DARABAN, S. , CIRSTEA, M.
This paper proposes a novel control topology which enables the setup of a low cost analog system leading to the implementation of a modular energy conversion system. The modular concept is based on hybrid renewable energy (solar and wind) and uses high voltage inverters already available on the market. An important feature of the proposed topology is a permanently active current loop, which assures short circuit protection and simplifies the control loops compensation. The innovative analogue solution of the control structure is based on a dedicated integrated circuit (IC) for power factor correction (PFC) circuits, used in a new configuration, to assure an efficient inverter start-up. The energy conversion system (control structure and maximum power point tracking algorithm) is simulated using a new macromodel-based concept, which reduces the usual computational burden of the simulator and achieves high processing speed. The proposed novel system is presented in this article from concept, through the design and implementation stages, is verified through simulation and is validated by experimental results. P. Shamsi and B. Fahimi, "Stability assessment of a DC distribution network in a hybrid micro-grid application," IEEE Trans. on Smart Grid, vol. 5(5), pp. 2527-2534, 2014. W. Li, J. Xiao, Y. Zhao, and X. He, "PWM plus phase angle shift (PPAS) control scheme for combined multiport DC/DC converters," IEEE Trans. Power Electron, vol. 27, no. 3, March 2012. C. Zhao , S. D. Round, and J. W. Kolar, "An isolated three-port bidirectional DC-DC converter with decoupled power flow management," IEEE Trans. Power Electron., vol 23, no. 5, pp. 2443-2453, 2008. Y. M. Chen, Y. C. Liu, S. C. Hung and C. S. Cheng, "Multi-input inverter for grid-connected hybrid PV/wind power system," IEEE Trans. Power Electron. vol.22, no. 3. pp. 1070-1077, May 2007. J. Hui, A. Bakhshai, and P. K. Jain, "A hybrid wind-solar energy system: a new rectifier stage topology," APEC, 2010, pp. 155-161. 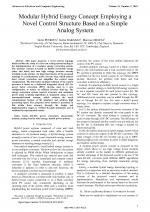 S. Daraban, D. Petreus, and C. Orian, "Control topology for high efficiency small scale wind energy conversion systems," in OPTIM, May 2014, pp. 1070-1077. S. G. Malla, and C. N. Bhende, "Voltage control of stand-alone wind and solar energy system," Electrical Power and Energy Systems vol. 56, pp. 361-373, 2014. Z. Wang, Z. Zou, and Y. Zheng, "Design and control of a photovoltaic energy and SMES hybrid system with current source grid inverter," IEEE Trans. Appl. Supercond. vol. 23, no. 3, pp. 1051-1055, 2013. S. Daraban, D. Petreus, and C. Morel, "A novel MPPT (maximum power point tracking) algorithm based on a modified genetic algorithm specialized on tracking the global maximum power point in photovoltaic systems affected by partial shading," Energy,vol.74, pp. 374-388, 2014. B. Somaiah and V. Agarwal, "Recursive Estimation-Based Maximum Power Extraction Technique for a Fuel Cell Power Source Used in Vehicular Applications," IEEE Trans. on Power Electron., vol 28, no. 10, pp. 4636-4643, Oct.2013. J. Chen, J. Chen and C. Gong, "Constant-Bandwidth Maximum Power Point Tracking Strategy for Variable-Speed Wind Turbines and Its Design Details," IEEE Trans. Power Electron., vol. 60, no. 11, pp. 5050- 5058, Nov. 2013. Steca Elektronik GmbH - "Steca PV grid Connected". S. M. MacAlpine, R. W. Erickson, and M.J. Brandemuehl, "Characterization of power optimizer potential to increase energy capture in photovoltaic system operating under nonuniform conditions,"IEEE Trans. Power Electrons.,vol.28, no.6, pp.2936-2945, June 2013. K. C. Tseng, C. C. Huang, and W.Y. Shih, "A high step-up converter with a voltage multiplier module for a photovoltaic system," IEEE Trans. Power Electron., vol. 28, no. 6, pp. 3047-3057, June 2013. M. Balato, and M. Vitelli, "Optimization of distributed maximum power point tracking PV application: the scan of the power vs. voltage input characteristic of the inverter," Electrical Power and Energy Systems, vol. 60, pp. 334-346, April 2014. P. S. Shenoy, K. A. Kim, B. B. Johnson, and P.T. Krein, "Differential power processing for increased energy production and reliability of photovoltaic system," IEEE Trans. Power Electrons., vol. 28, no.6, pp. 2968-2979, June 2013. H. Hu, S. Harb, N. H. Kutkut, Z. J. Shen, and I. Batarseh, "A single-stage microinverter without using electrolytic capacitors," IEEE Trans. Power Electron., vol. 28, no. 6, pp. 2677-2687, June 2013. D. Petreus, T. Patarau, S. Daraban, C. Morel, and B. Morley, "A novel maximum power point tracker based on analog and digital control loops," Solar Energy, vol. 85, no. 3, pp. 588-600, March 2011. K. Anderson, J. Du, A. Narayan and A. El Gamal, "GridSpice: A distributed simulation platform for the Smart Grid," Trans. Ind. Informat., vol. 10, no. 4, pp. 2354-2363, June 2014. P. Gavriluta, S. Spataru, I. Mosincat, C. Citro, I. Candela, P. Rodriguez, "Complete methodology on generating realistic wind speed profiles based on measurements," Renewable Energy & Power Quality Journal, vol. 10, pp. 828-833, 2012. 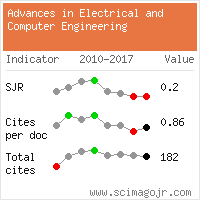 Citations for references updated on 2019-04-22 02:49 in 119 seconds.